The Iowa Association of Naturalists (IAN) and the Iowa Conservation Education Coalition (ICEC) are proud to award Saving Our Avian Resources (SOAR) with an IAN/ICEC Award for Excellence in Environmental Education. The award is the Frederic Leopold Environmental Education Award for outstanding environmental education efforts by business, industry, or labor. The IAN/ICEC Awards for Excellence in Environmental Education are awarded annually to recognize incredible contributions to the advancement of environmental literacy in Iowa. Kay Neumann started the non-profit SOAR twenty years ago. 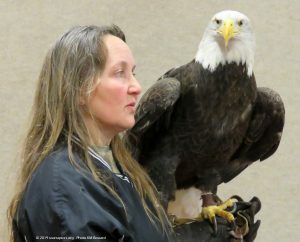 With the use of non-releasable live raptors, SOAR conducts programs across Iowa to bring attention to conservation issues related to raptors, such as lead ammunition and tackle in our environment. Since 2004, SOAR and other rehabilitators collected datat including lead level tests and x-rays on bald eagles admitted to their facilities. In 2017, a research article published in the Journal of Fish and Wildlife Management detailing their data analysis on lead poisoning in bald eagles. The findings indicated that adult bald eagles had higher lead concentrations than young eagles. Lead concentrations were highest across all ages of bald eagles during October through January, which is the same time frame as hunting and trapping seasons in Iowa. SOAR uses this information and conducts presentations, like the 125 programs they did in 2018, to promote the use of non-lead ammunition. Each year SOAR will talk to over 8,000 people and through other use of media, their information reaches over 10,000 people. SOAR joins a long history of outstanding environmental educators in the state of Iowa. The environmental education award is named in honor of Frederic Leopold. Leopold was an Iowa native and a successful businessman and community leader. He applied his personal beliefs about environmental stewardship to his business dealings. He enjoyed the outdoors and in his spare time, conducted one of the world’s most extensive studies on the mating and nesting habits of wood ducks. Congratulations to SOAR! Thank you for your outstanding efforts on behalf of environmental education in Iowa.